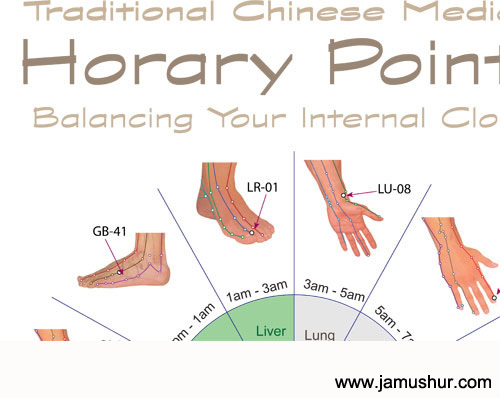 The Horary point is the local acupoint to a particular meridian (i.e. wood point on a wood pathway). This local meridian acupoint becomes a horary point during the two-hour period of maximum energy for that particular meridian. Outside of that time slot, it returns to a normal acupoint. 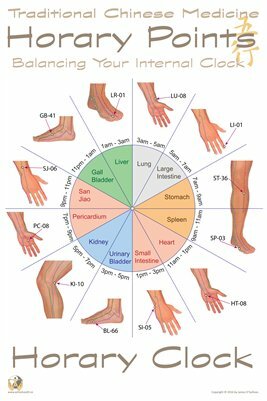 The horary acupoint become a very powerful point for body/mind/ spirit during the horary time slot. Activating the horary acupoint, we can reach the official and boost and revitalize the Qi of that element. It works similar to when a poker is used to stoke the ashes of a fire, and allow the fire to blaze. This class of acupoint plays a major role in some techniques involving the Stems, where some points are considered closed or open depending on specific time, month or year.